The Blooming Quill has been updated with a new design. Jessica has designed this site. This was the first time I've built a theme with the mobile first technique. It was a bit of a challenge to think "backward" from my normal thought process. It was fun, and turned out very nicely I think. In the end it does seem easier to add in features rather than take them away. 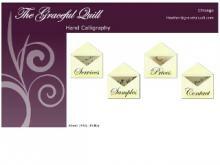 Another website has been completed - The Gilded Quill (learn more). This site is for a calligrapher with wonderful work. The old site hadn't been redesigned in several years and was looking dated. The new design by Jessica looks great. The store has also been incorportated with the rest of the site, driving more traffic to one URL and improving the SEO. Recently I completed the setup of a new WordPress site. Using the old theme as a baseline, I was able to bring in new elements improving the layout. The old site was built in Joomla, which was not a good fit for the client. Art in Lit is this new project I'm working on. It's in the very early stages, but there's something useful going on there. The plan is to create an index of artworks found in literature. This would be useful to students, teachers, and writers. Of course this will take a lot of time to document every artwork found in pieces of literature. So far just a few have been listed, and some not completely. But there's good news. Recently this amazing Chicago calligrapher (okay she's my wife) told me she wanted a new website. So we set about creating something. She's on a purple kick so we used purple for the design.